Now that it's fall, I can bask in all the loveliness that this too-short season brings - be it the beautiful autumn reds and golds of the changing leaves, to the crisp, smoky air, and of course, my favorite: the bountiful fall harvests of apples, pumpkins, pears, squash, and many others. I've been busy around my house, preserving many jars of fruit butters: apple and pear. 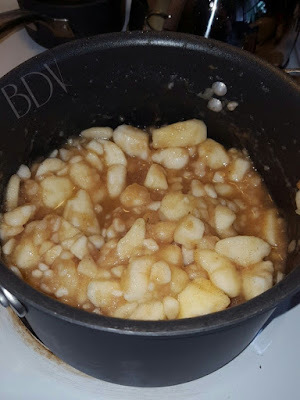 I made two variations of apple butter - one is more traditional with a mulled apple cider flavor. The second one is a concoction I threw together by accident - lemon clove. I wasn't paying attention to the quantity of cloves and allspice, so the flavor was... ahem... a little strong. To counter it, I used a bit of maple syrup and cooked a lemon into the softening apple mixture. It now has a really nice mix of lemon and clove - very refreshing and unique. I think I will post a recipe onto my other blog because it accidentally turned into something quite tasty. What are your favorite autumn traditions? I think that preserving delicious foods is one of my favorite things to do after apple-picking and pumpkin-sorting.